Home - About EFTA - News - Welcome to the new EFTA website! Welcome to the new EFTA website! 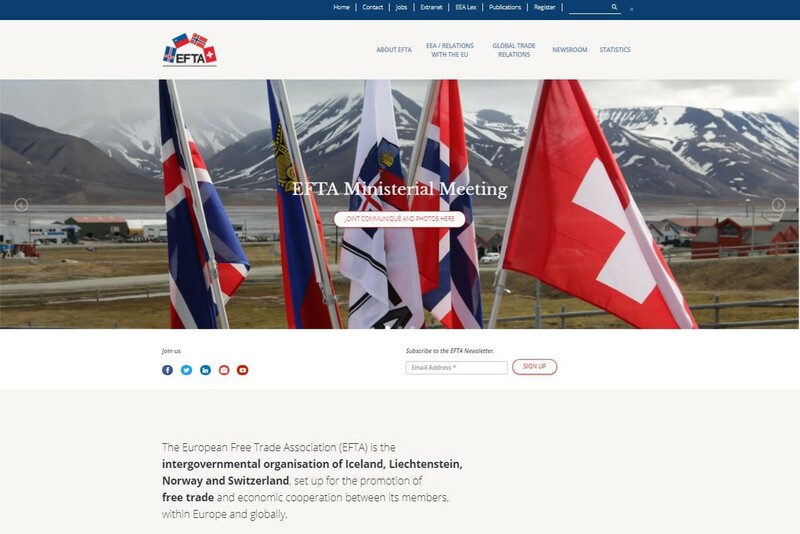 If you are a regular user of the EFTA website, you will notice that we have renewed the structure and design of the whole page. The new website is fully responsive for tablets and mobile devices. If you happen to notice any sub-pages that do not function properly on a smartphone, please do notify us. In addition, there is a special Newsroom - with news, photo archives, press communiqués and social media - and a menu for EFTA Statistics. These five main menus are visible on all sub-pages, as are the quick-links at the top of the page(s), with shortcuts to job opportunities at EFTA, EEA-Lex, the Extranet, publications, the EFTA Register and contact details. At the top right of the page you also find the search function, where you can search for any content on the whole website. If you have any difficulties finding information on the website – or if you have any comments – please send us your feedback in an email. The new website was designed and programmed by 1xINTERNET, a Drupal web agency in Frankfurt.